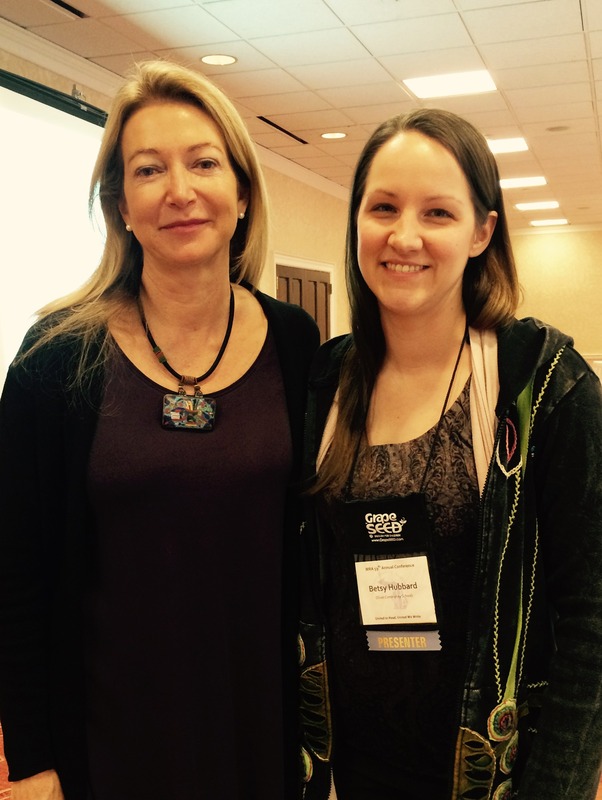 Back in March, I had the pleasure of attending the Michigan Reading Association conference in Grand Rapids, MI. I had been preparing my own presentation for the event and had neglected to look at the program closely enough to plan the rest of my time. I arrived and sat with an hour to kill to plan my day. Needless to say, my first session was a no brainer. Among several wonderful presenters, one stood out. Georgia Heard would be presenting on, Growing Readers and Writers Who Love Poetry. I knew that would be a great way to start my day and maybe I would be lucky enough to meet her in person, FINALLY! She began her presentation with a list of statements that I scrambled to write down. Here are the ones that struck me the most. See the world like a poet. Observe small moments around them. Love the meaning of sounds and words. Write from all of their feelings. She talked about how students change and transform as readers and writers with poetry. 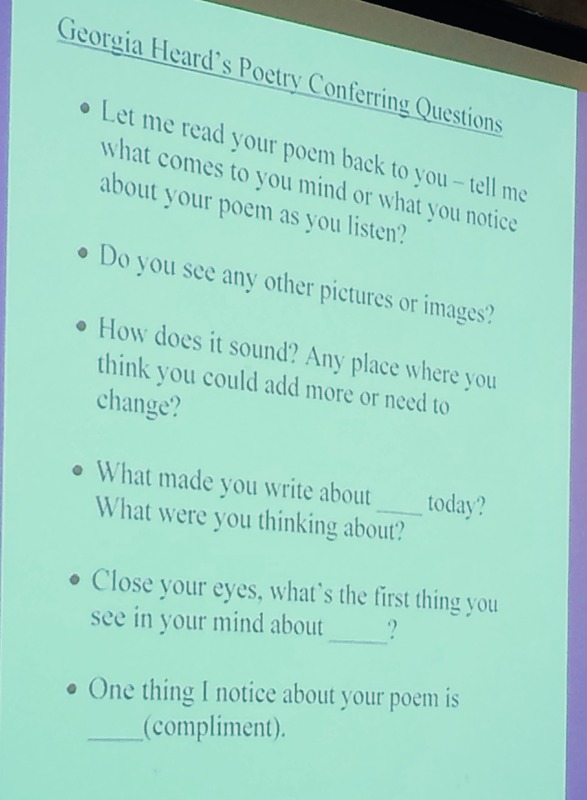 Poetry can unlock the struggle for struggling writers and open doors for all learners to make new connections. She also discussed the five doors that help students break into a world of poetry. Bring in something ordinary, describe it and generate ideas. One example was to use an apple. She referenced the poem , Apple by Nan Fry as a good example. Here is a list of Georgia’s favorite conferring questions when working with students. Here is a list of some of Georgia’s favorite poetry books. And here is lucky me, with the one and only, Georgia Heard. Perfect! I wish I had been there! These are great thoughts. I need to see what new books she has out. How lucky you were to hear Georgia Heard speak and how lucky we are that you’re sharing with us! Thanks! Great post. I love learning about what others learn. Thank you. Lucky you to stumble onto Georgia Heard. I have used her work with my Engish Language Learners and they have enjoyed writing poetry. 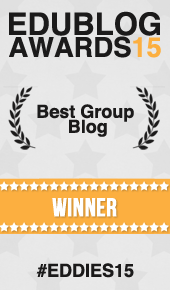 I appreciate the ideas you share with us in this post. 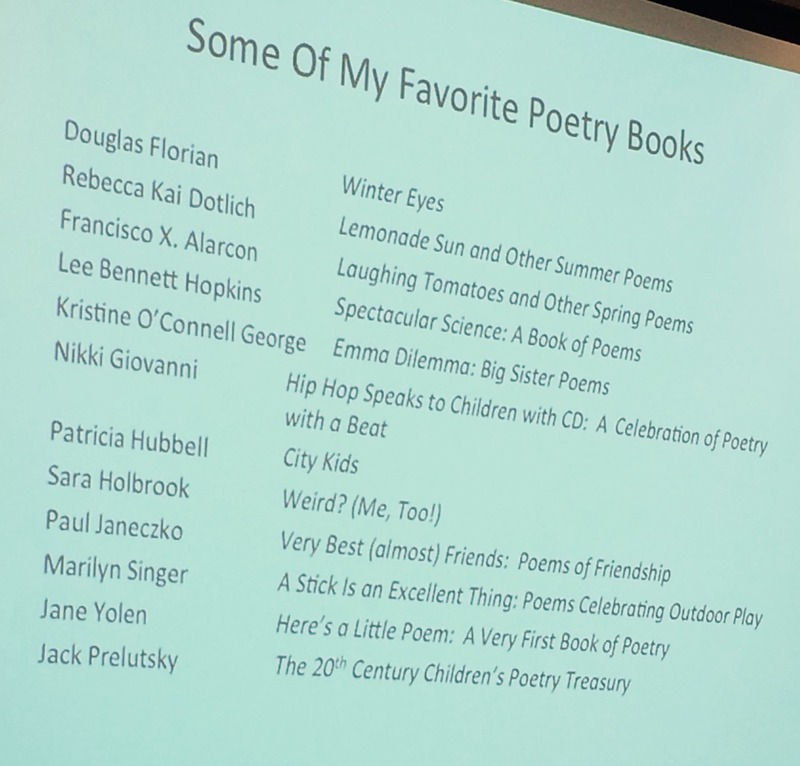 I agree with one of your commenters that every day (or as often as possible) should be poetry day because then the students become familiar and comfortable with a wide variety of poetic styles and voices, and, ok,…..because the world seems lighter and brighter with poetry in it! Those are great conferring questions. Thanks for sharing them! I sat with Georgia Heard at the NCTE Elementary Gathering. She is so welcoming and warm-hearted. I love Awakening the heart and use it often. To me, poetry should be every day in the classroom. Lucky you indeed! Thanks for sharing these pearls of wisdom from Georgia Heard. 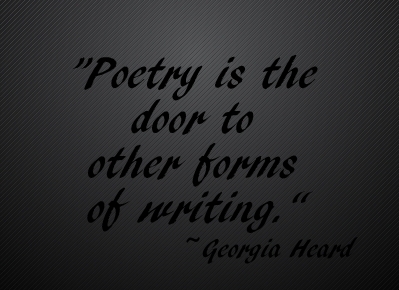 I especially love the idea of doors into poetry.